Working with a fast, efficient help desk software helps IT departments to respond to customer requests faster and in a more helpful way. In this article, we will compare and contrast two leaders of the market - Freshdesk vs. Zendesk. Both platforms provide 5 pricing plans. To make the comparison more transparent, we’ve picked similar plans that cost $19 per agent per month when billed annually - Zendesk Team and Freshdesk Blossom. 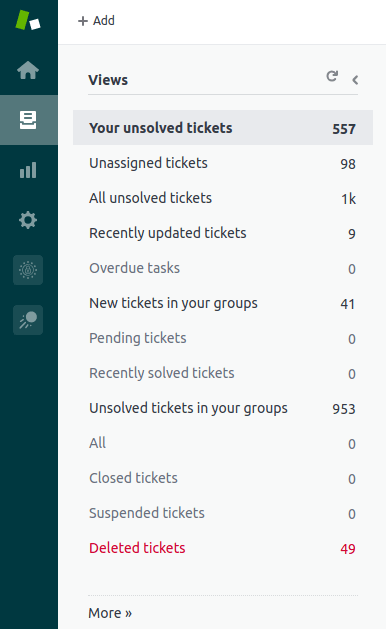 Freshdesk offers powerful ticket filtering. 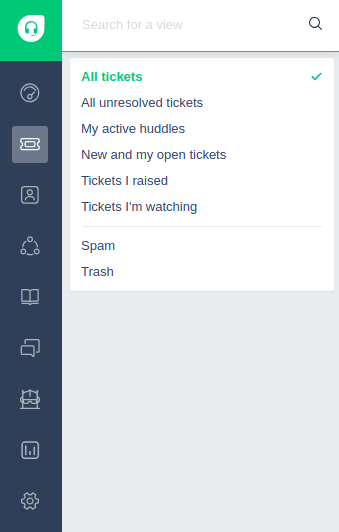 With a Ticket List View feature, you can select a specific set of tickets. In a dropdown menu, you can choose a view by certain criteria. Zendesk views provide a visual and informative interface. Zendesk arranges all your views on the left side of the screen. This way, you can select them with one click instead of two. There are counters in front of each category of the messages. Zendesk ticket counters help to monitor message volume in real time. Using answers to typical questions as templates save a lot of time. You can use predefined replies with Zendesk as well as with Freshdesk platform. Moreover, you can personalize the answers by using a customer’s name, surname and other information collected about the client. This individual data is put in placeholders. In Freshdesk, placeholders are grouped into categories that make them easier to find. In Zendesk, placeholders are presented in a long list, and inserting a new placeholder into macros requires extra copy/paste actions. Both platforms offer integrations with eBay and Amazon marketplaces. Besides basic functionality, Zendesk offers additional tools - eBay and Amazon autoresponders and multilingual Amazon support. The Dispatch'r tool for Freshdesk helps to set advanced triggers based on specific customer and order data from eBay and Amazon. free integrations for Shopify and MailChimp. But when it comes to more specific integrations, Zendesk outruns Freshdesk with over 700 available integrations compared to 330+ applications for Freshdesk (both numbers are valid for February, 2019). Self-service features are essential for excellent customer service. They give customers quick access to information, saving company time and resources. automatic sitemap generation to help new articles appear in search results faster. integrating the knowledge base with a free Knowledge Capture app to search answers without leaving a ticket. KPIs and metrics are essential tools for support teams which strive to provide an excellent customer experience. Although there are some basic metrics, every company has its own processes and individual performance indicators. So it is important that a help desk software provides convenient reporting and analytics tools to let employees quickly build reports and/or retrieve the necessary information. Let’s take a look at the reporting capabilities of the two leading help desks. track Zendesk help center usage metrics. surveys and reports to track customer satisfaction. As we can see, the Zendesk Team plan provides a unique Benchmark feature. But time and customer satisfaction tracking features are available only within more expensive plans starting from Zendesk Professional. So, for the same money, Freshdesk provides more in-depth reporting capabilities. Using a helps desk software as a client you need to be sure that you can count on quick and professional support. Both companies provide customer support over the phone, email and live chat. Freshdesk and Zendesk also offer an extensive knowledge base to help you get the most out of each product. Lastly, make sure to check out Zendesk and Freshdesk community for best practices, hot fixes and great pieces of advice. Who wins the comparison game? There’s no doubt that both companies provide robust and feature-rich solutions. And the best way to make the choice is to test each platform and see how it fits your individual business needs and processes. Once decided, use Help Desk Migration to transfer all your tickets and related data to the new software. Try a demo migration for free!